Ever since I had my c-section and lost a lot of blood, I've been on a green smoothie kick with coconut water. After living in Bahia Brazil and drinking fresh coconut water every day I can barely stand the boxed up kind. I put it in my smoothie because I know it's good for me but I hate the taste. I don't know how FOCO does but their coconut water is different from the other ones I have tried, FOCO tastes fresh. 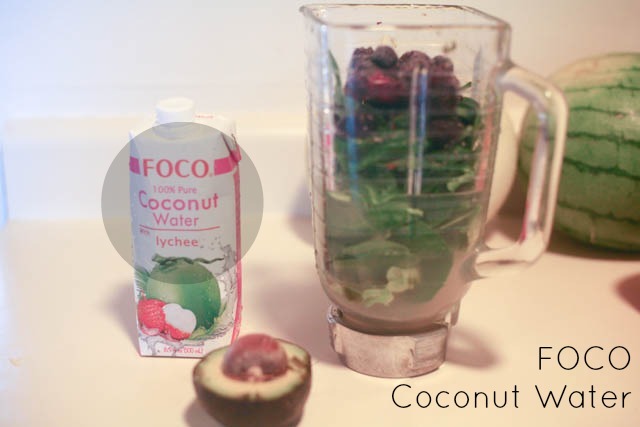 The tropical flavors help sweeten my green smoothie, and bonus - it's sugar free! I would love to have an Açai flavored FOCO. Yum! Right now you can only purchase unflavored FOCO coconut water, starting in March you'll be able to get the flavored kind. Make sure you try the lychee and the pink guava. Those two were my favorite. To check if your local supermarket carries FOCO go here. 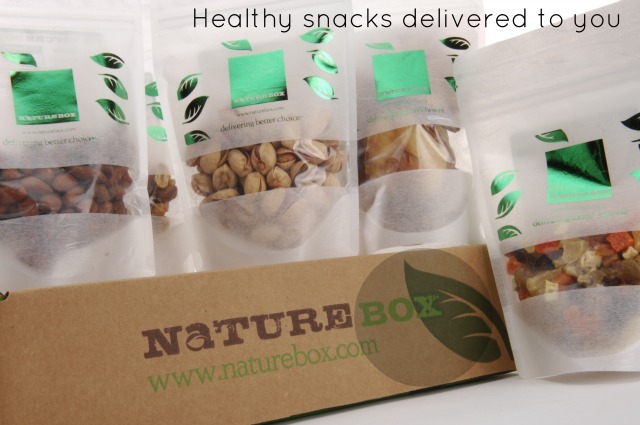 Nature Box, a subscription service where you get a box with 5 healthy snacks delivered to you for $19.95 a month. If you like carrot chips, country ranch peas, and chipotle maple almonds, this subscription service is for you. I like how diverse the snacks are. I like how all of the ingredients are natural, with no trans fats, no artificial sweeteners, no artificial flavors or colors. These are the kinds of snacks I like feeding my kids. The price. I don't think $19.95 is necessarily a bad deal, but it feels like a luxury to spend almost twenty bucks on snacks when you have a family of 5. On that note, I could see this as a treat my kids would enjoy, specially the surprise aspect of it. If I told them every month we would get a new surprise box with snacks inside they would be all over it. Less money going towards goldfish crackers and more money going towards dried pears - it could happen. You can subscribe online here. You can also give a subscription to someone as a gift. Shipping is free. 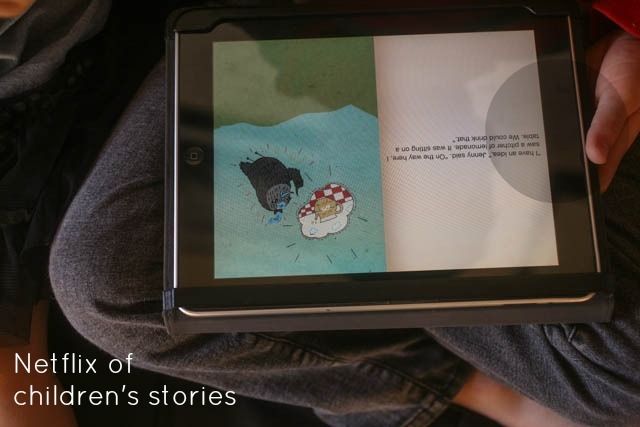 FarFaria, an iPad app with over 300 stories, 5 new stories added weekly, and all with the read-to-me feature for $3.99 a month. I don't like it, I love it! Since we don't have a TV we let the kids use the iPad for entertainment. Enzo and Maria each get 30 minutes a day to play or watch something on the iPad. Normally they go straight to Netflix and watch an episode of My Little Pony. These days they've been going straight to FarFaria. The app is beautifully illustrated and very intuitive. The read-to-me feature is great for little Maria who is still learning how to read. Also, there are some super cute foodie stories, my fave! I would love to see some stories in Spanish. Get a subscription here. If you'd like to give it as a Valentine's gift go here. // Instagram for Chrome, my new favorite way to check out my Instagram feed. // Superbowl recipes with the Foodie app. // This great interview with Mrs. Patmore from Downton Abbey about life in that TV kitchen. 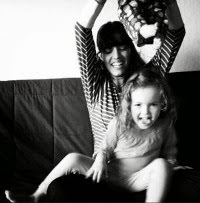 // This super cute blog and this super cute blog too. Have a great weekend. We're off to Santa Barbara to celebrate our nieces first birthday. We're excited to be with family again. ps- Some of the products mentioned in this post were sent to me for reviewing purposes. I was not compensated to write this post. Opinions expressed on my blog are always my own.